Whilst thrifting a few weeks back now, I spotted this lovely dress in Salvation Army for only £2.49. It is vintage and I would think maybe 70s or 80s, but you can see where my inspiration came from to spot this-it has seagulls all over it!! I think it's quite a different print to find and another different look for me this summer-another vintage for the collection!! The dolphins are so cute!! & that dress is such a bargain! You look fab in it :) I especially liked that you added a belt to it! Looks lovely - have any of your neigbours spotted you posing yet! ohh i love that stella ourfit! the color of yor dress is divine..
Hi pammish-thanks so much!! You absolutely rock in all your amazing outfits!! Hi yiqin-thanks a lot-I like a belt with it and I also like it loose! 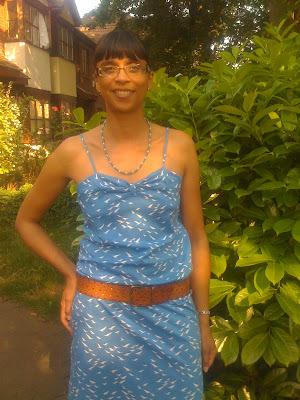 Hi Wendy-thanks so much-yes ideal for summery days! Thanks a lot, Ladies who Lunch!! Hi kate-ha ha, that bush featured isn't even in my garden-so I'm bound to attract the nosy neighbours!! Hi saray-yes I'm loving the Stella one too-thanks a lot!! ohh that dress is fab! Great find! Love the dress on you, fits you very well. Oh and I also want the iphone!! Another post, haha!!! so cute! I've been looking for a bird silhouetted scarf for ages. You look fabulous, Sharon, dear! The color looks perfect on your skin, and the belt is such a lovely touch to make it very casual chic. Love your shoes, too! That cornflower blue looks lovely against your skin tone! I love this find of yours! So cute, what a great find! You make me wanna go thrifting. Hi Pamcasso-thanks so much-hope you find one!! Hi dear Ida-thanks very much, you're so kind!! Hi taghrid-thanks so much and thanks for stopping by my blog!! Hi winnie-thats lovely, thank you!! Hi fashion chalet-so kind, thanks so much!! Hi always in style-thanks so much for stopping by and thanks for the comment too! Hi ruby may-ha ha, no worries! I will add you to my list!! Hi secretista-thanks and you should do!! Hi on track-thats lovely, thank you!! Really great find Sharon! Of course, you managed to find a dress with such a rare and beautiful print for less than £3! That shade of blue is gorgeous on you and I love how it looks paired with the brown belt! Hi Danz!! Thanks so much for that-it is ideal for summer! !